Additionally, Event IDs 465 and 477 are logged in the Application log. This indicates that the mailbox store database is damaged or in an inconsistent state. Start the command prompt and navigate to the 'Drive:\Program Files\Exchsrvr\Bin' folder. Run the following command at the prompt: eseutil /p "drive:\program files\exchsrvr\mdbdata\database_file_name.edb" This will repair your damaged database. To prepare the database for use in production environment, defragment and rebuild the database. You can do so by running the given command: eseutil /d /t:x "drive:\program files\exchsrvr\mdbdata\database_file_name.edb"
Check the state of your database by viewing the output of the given statement: eseutil /mh "drive:\program files\exchsrvr\mdbdata\database_file_name.edb"
To fix logical corruption, run 'Isinteg' tool as follows: Isinteg –s exchange_server_name –fix –test alltests You will be asked to select a database for running this utility. Run this command several times until the output shows zero errors. Repeat this procedure for each database in the storage group. Try mounting the databases and performing an online backup of the storage group. If you fail to fix the above said Exchange database error, use Stellar Repair for Exchange to fix, repair and restore your damaged databases. The software employs safe and ingenious technique to scan your damaged database and recover all user mailboxes from this database (.edb) file. It allows you to save the recovered mailboxes as PST files that can be easily imported into MS Outlook. 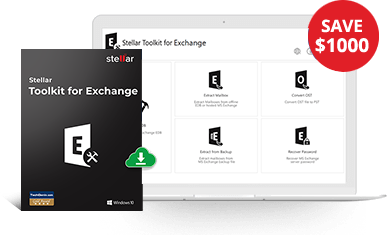 Stellar Exchange Database Recovery Software supports recovery from database files of MS Exchange 2019, 2016, 2013, 2010 (SP2, SP1), 2007, 2003, 2000, and 5.5 versions.